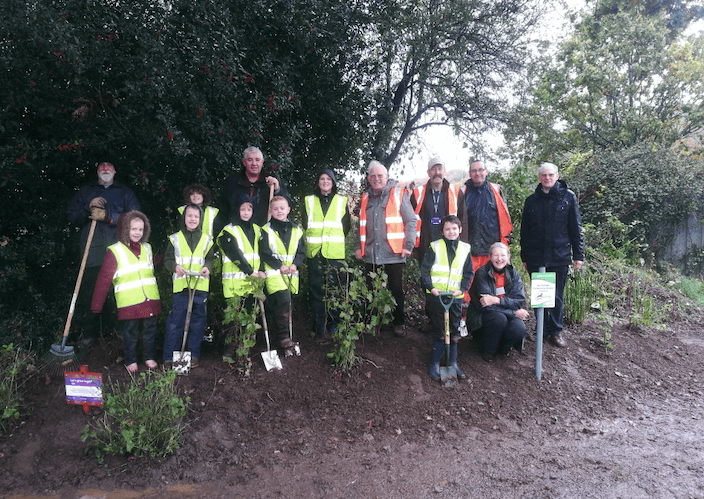 A Buckfastleigh community garden will blossom in spring thanks to a conservation event led by Teignbridge District Council’s Green Spaces team and with help from pupils from Buckfastleigh Primary School. Daffodil bulbs have been planted at Buckfastleigh’s Duckspond Recreation Ground and come Spring will be ready to flower alongside 500 Crocus Corns which have been donated by members from the Rotary Club of Ashburton/Buckfastleigh. In a show of community effort, help in sowing the seeds also came from school Governors, Ideverde grounds maintenance contractors, and Rotarians. During autumn and spring the Green Spaces team work closely with schools and community groups to organise events which encourage caring for the environment. As well as providing an attractive focal point for the local community to enjoy and take pride in, the community garden is part of the Rotary’s Purple4Polio campaign. This has seen Rotary clubs worldwide donate 2.5 million purple crocus corms to their communities to draw attention to the need to make a final effort to eradicate polio. This community-focused activity highlight’s Teignbridge commitment to be ‘out and about and active’ as part of its ten year strategy. This includes a particular focus on providing events and school activities that encourage the use and understanding of green spaces, and is part of a programme of conservation activity days. Cllr Charlie Dennis, Teignbridge District Council’s Ward Member for Ashburton and Buckfastleigh, said: “I feel it's very important to introduce children to the delights of gardening and what better way to do it than with their class mates at school. Cllr John Nutely, Teignbridge District Council’s Ward Member for Ashburton and Buckfastleigh, said: "Having a community garden that everyone can enjoy and be involved with is very rewarding. I am extremely pleased in seeing the pupils from Buckfastleigh Primary School taking pride in the gardens and helping to plant the daffodils and crocus. I’m sure the pupils, community and also visitors will now look forward to spring when the gardens will be full of colour and the pupils can look at the gardens with pride at what they have achieved." Andy Blackburn, President, Rotary Club of Ashburton/Buckfastleigh, said: "We are delighted to support the achievements of the pupils in creating their wonderful community garden, and at the same time draw attention to the need to make the final push to eradicate polio throughout the world."